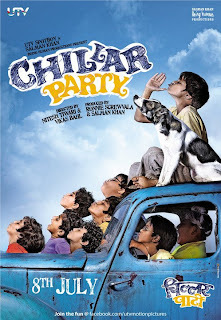 Chillar Party did not have a good opening but has shown growth in the business over the days indicating that the film has been appreciated by the audience. Most people who have seen it have liked it specially for the kids' performances and its simplicity. However the film lacks appeal for the audience who look for typical paisa-vasool entertainment which is also clear from the promos. The film seems to be doing rather well with family audience and seems to be a good option specially since the other two big films which are doing well at the Box Office are both for adults. It isn’t half bad, but the party pooper here is a script that has no direction home. The film strikes a perfect balance between the two poles of the script. Well, almost. A story of grit and determination, it works not just as an entertainer, but also advocates a message rather strongly. The film is filled with endearing instances of humour that are as well written as they are well acted, except for a few scenes in which the children are made to try too hard to be adorable.